Both rising rates and President Donald Trump's tough talk on trade have weighed on the rest of the stock market this year. For the former, market players fear the struggling equities environment which follows substantial moves in rates. Five months after a rate spike like the one seen in the first quarter, the S&P 500 declines on average by 0.3 percent. The second factor, Trump's trade talk, has destroyed more than $1 trillion market value so far, according to J.P. Morgan on June 6. The firm highlighted the impact of trade and protectionist ideology as significant market headwinds, which have only continued to escalate. "Returns reflect markets facing macro uncertainty and tightening financial conditions," BlackRock global chief investment strategist Richard Turnill wrote in a note Tuesday. 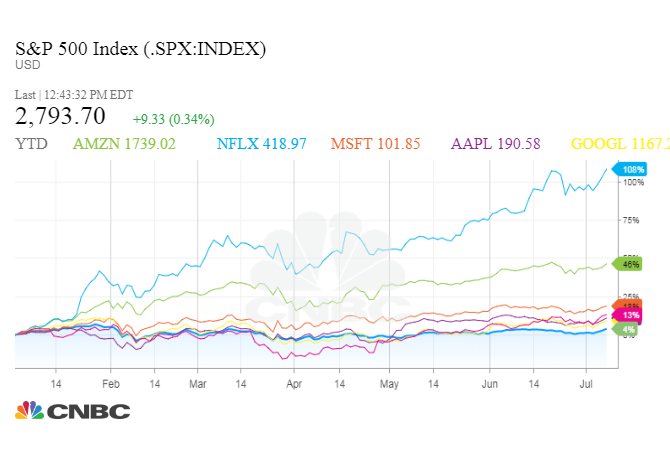 In total for 2018, the six stocks make up 98 percent of S&P 500 returns and 105 percent of Nasdaq 100 returns. The S&P 500 is up 4.4 percent for 2018, while the Nasdaq 100 is up almost 14 percent. – CNBC's Robert Hum contributed to this report.